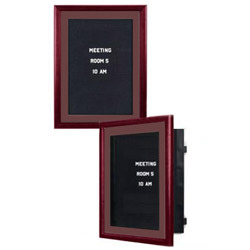 These Cork Boards Have a Mahogany Wood Exterior and a Mahogany Wood Framed Acrylic Door! These Cork Boards Come with Plastic Letters and Display on the Wall! These Cork Boards Are Ready to Be Bought at CorkBoards2Go.com! Cork boards are enclosed letter boards for your display subject matter. Office, school and hospital directories are merely a few displays where you'll want to use these cork boards. These enclosed letter boards are easier than most other sign systems because of their uncomplicated gravity latch closure. It's so easy; you can operate the swing frame's closure with one hand. 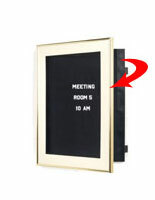 Masked hinges and gravity closure further promote the enclosed letter board's or directory board's maintain, unfussy design. The complete directory board's profile is 1 7/8" from the wall. These are surely sleek and stylish changeable letter board displays. 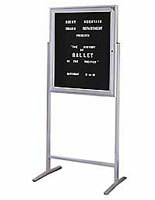 The total directory board's frame is 33 1/2" wide x 39-1/2" tall with a light, mahogany wood finish. The mat board color complements the mahogany finish, and stays attached to the interior of the frame, leaving the letter board panel free for message changes. The letter panel on the cork boards is covered 0.5" all around by the mat. 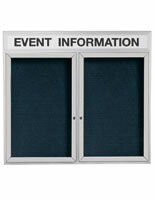 The complete directory is enclosed with break resistant acrylic. 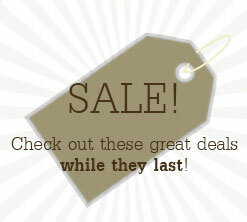 Buy these cork boards for your office and lobby directories now! Spell your subject matter.out for all to view on these letter board cork boards. These cork boards are a manufacturer preference to other sign systems. 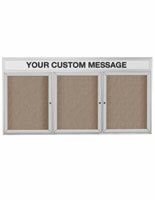 Cork boards, likewise recognized as changeable letter boards enable you to exchange your message with comfort and style. These cork boards are encased in a swinging frame with concealed hinges and gravity latch closure. 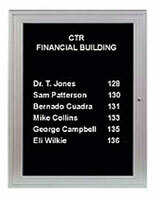 This enclosed letter board, or directory board stays mounted on the wall while the front of the swing frame opens to a full 90 degrees permitting easy letter and message changes. We supply our cork boards and changeable letter boards with the hanging hardware provided. The changeable letter boards, or cork boards also come with a set of 3/4" white, plastic Helvetica letters and numbers that surely stand out against the grooved black felt letter panel. 33.5" x 39.5" x 1.9"